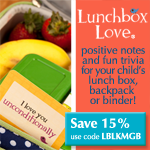 A LunchBox Love Note was the inspiration behind this bento! 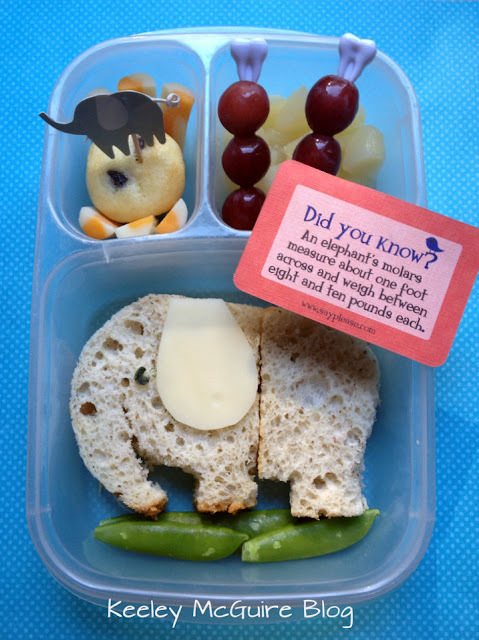 I had bought a set of sandwich cutters from my Dollar Tree a few months ago that contained an Elephant, Rhino, & Alligator. I hadn't used them yet, so it was the perfect time to try out the Elephant. The cutter happens to be bigger than our Udi's bread slices so I had to piece the SunButter & Honey sandwich together. I was so excited because our grocer finally got in the Udi's Whole Grain (nut, dairy, soy, & gluten free) bread. So this is her first sandwich on that particular kind. His ear is made of swiss cheese and so is his eye. It's also colored in with a food safe marker. He's walking on a bed of sugar snap peas. Big D's bottom front teeth are loose! I am in serious need of those uber cute picks!!! I have not found these yet at my dollar tree... SIGH... would you perhaps post a picture of the packaging to make them easier to find? Hahaha LadyCakes. Any time :) Love the lunch!